Given the increasing number of users of Android devices today, be it smartphone or tablet, surely you want to know the value of your device benchmark compared to other Android devices. Because benchmark values usually become a benchmark of how sophisticated Android devices, and how great the performance of the hardware it has. Including if you choose an Android device as a portable gaming machine. Here we select the 5 most popular and free smartphone benchmark apps of course, which can test and score your Android device. Not only displaying scores, some of these apps also collect scores that are uploaded by users and make it a universal database. Quadrant is well known as a very simple but very good benchmark app where Quadrant can test the hardware performance of your Android device, from CPU, GPU (2D and 3D) memory, and I / O performance. Free version Quadrant is a standard version that has an ad bar but does not have a custom benchmark feature. This app is much preferred for being able to benchmark 2D and 3D graphics performance well. In just a few minutes, the performance test is complete and instantly displays your device's score in comparative graphics with some other popular Android devices. One benchmark tool that also has many useful features. These apps also test a variety of hardware on your smartphone or tablet. 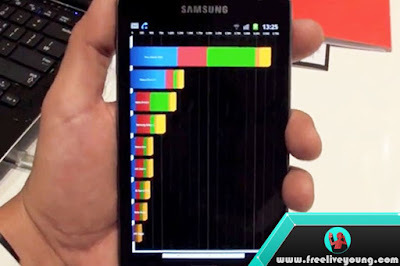 This free Antutu does not detract from the custom benchmark feature like Quadrant Free. In Antutu, the sub-test that runs is categorized more generally under tested categories such as OS, RAM, CPU, GPU and I / O. Score results also come with a ranking among other popular Android devices. Interestingly, a brief commentary on the overall performance of the device is added. If you want to use the all-in-one benchmark, then Quadrant and Antutu are the ones you can count on and have full features. This one benchmark offers a fairly complete package. Measured performance measurements are compiled from various sub-tests that completely deplete the hardware capability of an Android device. In Metal Benchmark, for example, there are several sub benchmarks which all represent the basic bases of Android applications such as dhrystone, Linpack, streams including Ram and I / O benchmarks. The latest versions, we can also test how fast our CPU while working simultaneously (multi-core). And the sub-test in it is a re-developed Metal sub-test to be able to explore all available cores. This application is a well-known Futuremark application that was previously known as the developer of PC benchmark creation. Benchmark results of this application are also in the collection for us make the guidelines, where the position of the performance of our Android device. And uniquely, 3D Mark is not only collecting scores android device, but also can measure the performance of the device operating system IOS. If you look at the categorization of values, you will be immediately reminded 3D Mark 11. Yes, the 3D categorization of Mark Ice Storm for Android devices and other devices supported by this application does seem to be inspired by 3D Mark 11 which sorts GPU and CPU testing only. And 3D Mark is still making FPS as a reference to a desktop version. If you are relying on your android device as a portable gaming device, it generally requires a large storage size as a container of game files, especially modern 3D games whose character files are very, very big. Well, internal storage alone will usually soon be full for a 3D game that BSA reaches 8GB of its data file. For that, we need additional storage which is usually a micro-SD card. To convince us if the extra storage is qualified when relied upon as a new game data file location, we must test it first with SD benchmark application. And from some of the existing SD benchmarks, A1 SD Bench is the best value because, in addition to offering testing for external storage, this application also offers testing for internal storage as well as existing RAM. Actually there are still some benchmarks for smartphone android extreme like Rightware BrowserMark - Apps testers how high your android browser performance without installation, Real Pi Benchmark - which offers benchmark CPU based on mathematical inquiry, or Battery Benchmark - which will test the resilience of your android battery device despite the noise that many complained by its users. Well, was ready to investigate how fast the performance of your latest Android device and compare with other users' devices from around the world ?. For some users who want to compare the performance of their device after upgrade it with custom rom can also take advantage of benchmark applications above.